Need help with Tropix or Tropix 2? The graphics look wrong, or all I see is a blank screen. What's that all about? Why is the game running slowly, or why does the mouse cursor seem to be so jerky? Can multiple users have different accounts? What are the recommended system requirements for Tropix? What are the recommended system requirements for Tropix 2? Is there a version of Tropix for the Mac? How do I start a new game in Tropix? How do I disable the Tropix or Tropix 2 screensaver? 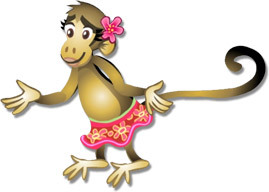 I love Tropix and I love the monkey! Where can I get cool Tropix-themed merchandise? Tropix looks so cool! How can I buy the game right now? My question wasn't covered here. How can I contact you guys? Your graphics drivers may need to be upgraded. Go to the website of the manufacturer of your graphics card to find the most recent drivers. Tropix and Tropix 2 require a 3D video card supporting DirectX 7 in order to run at full speed. Make sure your computer supports the minimum system requirements. If it does, but your game still runs slowly, you may need to update your drivers. Can multiple users have different profiles (i.e. saved games)? In Tropix 2, yes! The first dialog you see each time you start Tropix 2 includes the option to switch profiles. Tropix 1 does not support multiple user profiles, but you can reset your game on the "options" menu. Make sure you have the latest version of Tropix 1 installed to access this feature. Is there a version of Tropix or Tropix 2 for the Mac? Sorry, Tropix and Tropix 2 are currently supported on Windows only. We love Macs and hope to provide games for that platform in the future. In Tropix 2, you can simply create a new user profile (click "switch user" from the main menu). In Tropix, however, there is no in-game way to start over - you'll have to erase your saved game files to make that happen. Find the "user" folder wherever Tropix is installed (for example, C:\Program Files\Tropix\user) and delete the contents of the "user" folder only. That is, keep the empty user folder there, but delete the files inside it. This will restart your game. Right-click your Windows desktop, select "Properties", and click the "Screen Saver" tab. Here you can enable or disable the Tropix or Tropix 2 screen savers. You can find Tropix t-shirts and other cool gear in our online shop. Whoa! Slow down! We wouldn't feel right letting you purchase a game without having tried it out first. Download the trial version of Tropix 2 or Tropix. The downloaded game will give you purchasing instructions. You can reach us at contact@robotsuperbrain.com if you have other questions about Tropix, or if you just want to shoot us an email to say hi.